Elizabeth Gross: (BA, CATP, CTI, CYT) is a graduate of the 1025 hr. 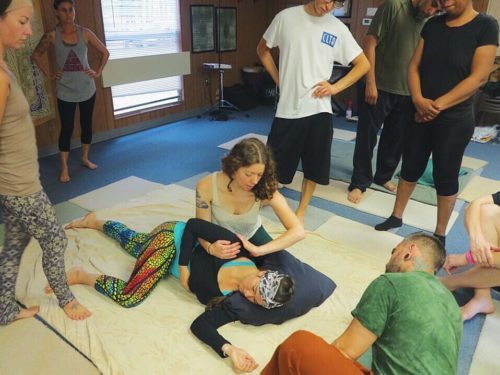 SomaVeda® Thai Yoga Teacher program at the SomaVeda College of Natural Medicine: Thai Yoga Center, a 600-hour certified Advanced Somaveda®Thai Yoga Therapist (CATP) and 500-hour Embodied Flow certified Yoga Teacher living in Accord, NY. Elizabeth’s product line “Selkie Botanica: Radical Self Care Products” consists of traditional healing artworks for modern living with a focus on womyn’s health and lymphatic drainage support. Her business “Dharmawake: Traditional Yoga Therapy for Modern Living” consists of educational and experiential events in yogic movement and mediation practice, SomaVeda® Thai Yoga Therapy and Earth Skills Education. 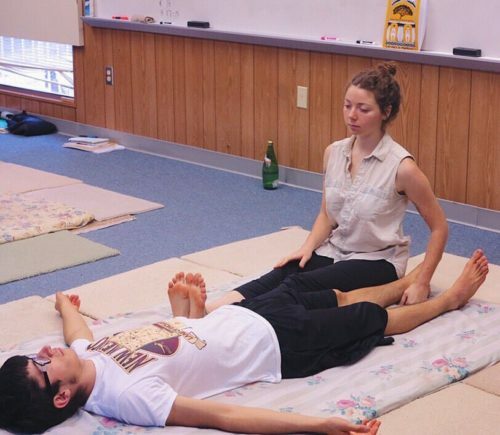 Elizabeth is available for group or private yoga instruction, SomaVeda Integrated Traditional Therapies® Thai Yoga Therapeutic Programs and workshops in Earth skills education and womyn’s health. Event details can be found on her website: www.dharmawake.com.